Welcome to the Burger Blog from your South Austin rentals! For a city that’s known for tacos and BBQ, Austin sure does have a lot of high-quality burgers joints. Actually, the Texas Hill Country as a whole is filled with hole-in-the-wall burger restaurants that serve big, juicy patties. We’re suckers for a good burger, so we want to tell our residents where they can find the best of the best. Check out the post and share it with your friends and your South Austin apartment community! As soon as you step out of your car and see the building, you’ll know you've arrived at one of the best burger joints in Texas. They have a huge selection of burgers — including black bean veggie burgers — and everything comes with some of their housemade sauce. This sauce is amazing, and we recommend asking for an extra cup just so you can dip everything in it twice. We also recommend the tater tots, which are super crispy — just how tots should be. This place also has shakes and malts, so save some room for dessert! We love Hut’s because you know exactly what you’re getting as soon as you walk in. You’re going to get a classic, greasy burger for a price that will make you feel like you time-warped to the 1950s. Actually, the entire establishment will make you feel like to stepped into a time machine. Hut’s is located on 6th Street, but it’s a nice reprieve from the hustle, bustle, and shiny lights that surround it. Check out Hut’s next time you’re craving a taste of old-school Austin. When you see a restaurant that spells is “haus” instead of “house,” you can assume they have awesome food. That’s just a general rule of thumb. Dale’s Essenhaus adheres to this rule. In fact, more than a couple Yelp reviewers say that Dale’s has the best burgers in Central Texas. That’s high praise, but we think you’ll find that Dale’s lives up to the hype. Dale’s burgers are crazy juicy. They’re so juicy, that you have to eat them kind of quickly or the buns will start to get soggy. Dale’s uses super lean beef that’s somehow still filled with juices and flavor. We’re not sure how they do it, but we hope they never stop doing it. This adorable little eatery is in Florence, TX — a town that has a Main Street and not much else. Located a little north of Georgetown, Chunky Cow Creamery is definitely worth the drive. 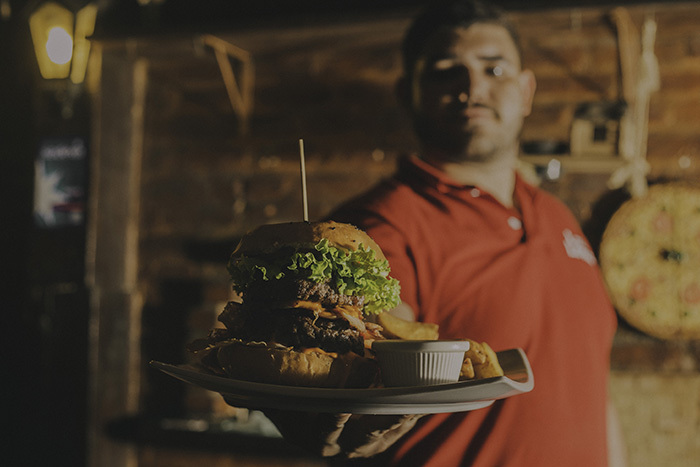 Their special burger is called the Cowboy Burger, and we assume they named it that because it doesn’t play by the same rules as everyone else. The list of toppings is so mouth-watering it’s almost unfair. Check this out — pimento cheese, bacon cured in-house, hatch chiles, pickled jalapenos, onion rings, a fried egg and pomegranate sauce. Despite the long list of toppings, this burger isn’t overwhelming by any means. You’ll be able to eat the whole thing, and you might even have some room left over for a side of baked potatoes. Those are all the burger joints we’ve got for y’all this week, residents! As always, we appreciate those of you who’ve come back month after month to read our blog posts. We hope one of these burger joints becomes your new go-to spot for burgers! If you found some gems in this post and want to see more posts like it in the future, please bookmark this page so you can check it again in a couple weeks. Also, go ahead and follow The James at South First on social media. That’s the best way to stay informed about everything going on at your community of South Austin apartments for rent.